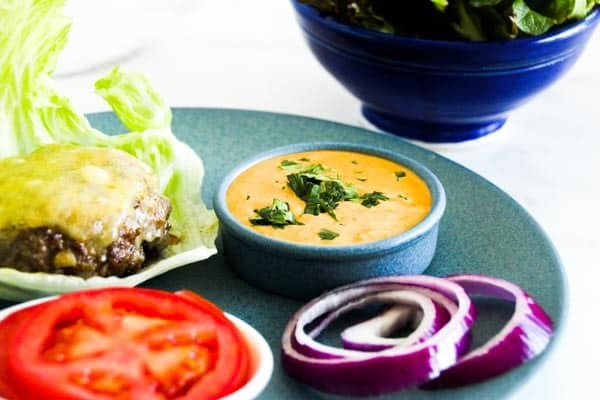 This juicy, low-carb burger smothered in spicy chipotle mayo and wrapped in a crispy lettuce wrap is the ultimate in keto decadence. Don’t tell anyone…. I used to love going to MacDonald’s as a kid and I would always order the same thing – a cheeseburger, fries and chocolate sundae. I was never allowed to have Coke. I think I liked it so much because we didn’t go that often, so it was a special treat. My best friend’s Dad refused to go to MacDonald’s ever, so she only went on those rare occasions when her mom would sneak them there when her Dad was away on a business trip. So I have great memories of those burgers, but they don’t seem to taste as good anymore. Probably because of the sugar in the buns or perhaps the excitement has just worn off over the years. Now that I prefer to eat low-carb, a traditional burger doesn’t really cut it. But – I do miss burgers and their juicy, decadent, soul restoring taste. 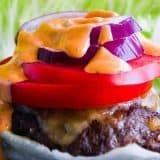 I’ve been playing around with various low-carb burger recipes lately. I’ve found that the fewer ingredients in your burger patty the better. You want it to be juicy and full of flavor so don’t choose lean ground beef. Go for the highest fat % possible (70-80% lean) as that will add flavor. Regular ground beef is usually the highest in fat content (25-30%). Many of the flavors also come from the sauce you choose and the fixings. Also, go for a coarser grind of beef if you have a choice. A coarser grind is great for a light, juicy texture whereas a finer texture suits dishes like meatballs or meatloaf. 1. Flash freezing – place patties on a tray covered with parchment paper then pop into the freezer. Once frozen, transfer to a zip-lock bag. This method prevents the patties from freezing together in one big clump in a freezer bag. You can easily grab a couple out of the bag as they are not all stuck together. To remove whole lettuce leaves without breaking or tearing – slice off the stem and then hold the head of lettuce under running water. The outer leaves will begin to separate and come off easily in one piece. 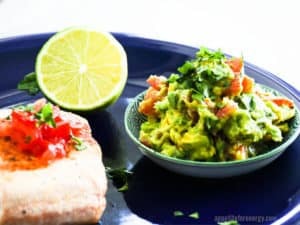 For more ideas on how to eat low-carb when the rest of your family isn’t interested – see our post here. 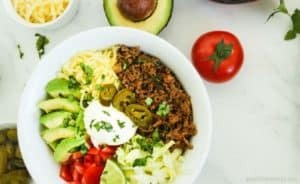 Have you tried these easy other family friendly 30-minute low-carb recipes? 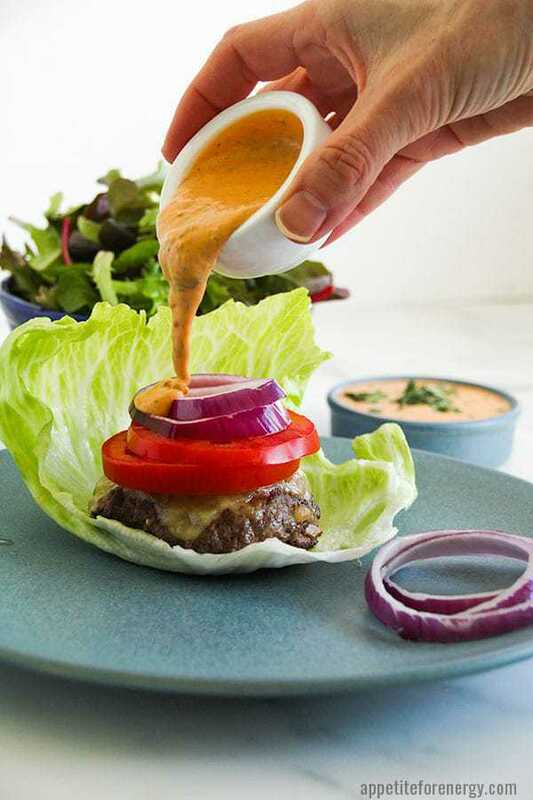 For the BEST bunless, low-carb burger, look no further than our juicy, decadent, soul restoring Low-Carb Burger With Chipotle Mayo. 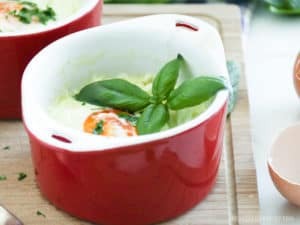 Ready in 30 minutes with 9g of net carbs. Place the mayo, chilies, sauce, cilantro and lime juice into a small food processor and process till well blended. Place a large fry-pan over medium heat. Place the ground beef, diced onion, garlic and steak seasoning a bowl and combine well. Divide the mixture into 4 even sized balls, then flatten well into burger patty shapes. Add the oil to the frypan and cook the burgers for 3-4 minutes per side or until cooked to your liking. Prep the fixings while the burgers are cooking - slice tomato and red onion, wash and remove lettuce leaves. Once burgers are cooked, heat your broiler (grill). 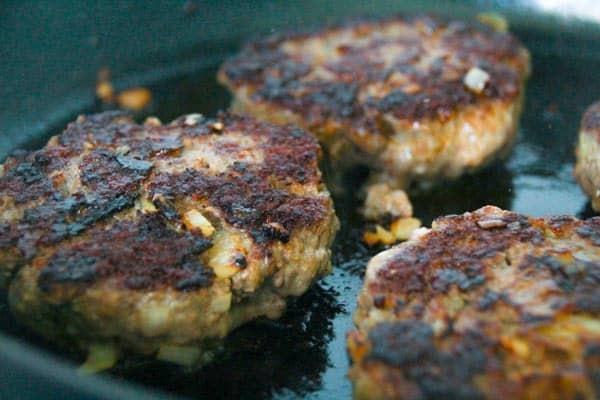 Place a slice of cheese on top of each burger patty and place under the broiler for a minute or 2 to melt. Place meat patties inside lettuce leaves, add tomato, red onion, dollop over the chipotle mayo and wrap the lettuce around. Optional: If you have some Cloud Buns on hand, use instead of lettuce leaves as a substitute for buns. To remove whole lettuce leaves without breaking or tearing - slice off the stem and then hold the head of lettuce under running water. The outer leaves will begin to separate and come off easily in one piece. Thanks for highlighting this recipe. I love a good lettuce wrapped burgers. I wish more restaurants would offer these. I mean, they will do it, but the lettuce leaves a little to be desired so it doesn’t work as a “bun”. very well. Also, thanks for the tip on separating the lettuce leaves. It’s new to me and a helpful tip! Yes – wouldn’t it be great if you could get a good lettuce wrapped burger at any restaurant? Hopefully more will start to offer it! !